This is the new Harris Sigma CD digital transmitter for WBZ-DT (channel 30). 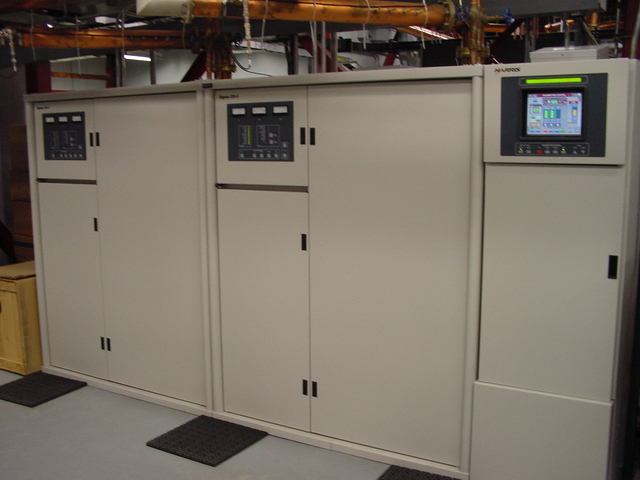 This is a gaseous-state transmitter, with control electronics and exciter in the right-hand cabinet, and two independent Inductive Output Tube-based power amplifiers in the left and center cabinets. There is space to the left where a third PA cabinet could be installed to provide for redundancy; at this point, there is not the economic justification to provide for full-power operation during maintenance. See the next photo for a look inside the cabinet.